There isn’t just one type of peach. You say, I know that, there are white peaches too. There isn’t just two types of peaches. You say, I know that, I have seen those weird misshapen flatten, what do you call them……donut peaches. Yes Those. There isn’t just three types of peaches. You say, nectarines don’t count as a peach. Point is there are many different varieties of peaches, whether yellow or white flesh, or donut shaped. Yeah, the grocery store may call them all peaches, but there are numerous varieties. They are different shapes, textures, flavors, levels of sweetness, levels of acidity, etc. There is a diverse world of peaches. And I am ready to explore it. Thanks to one Georgia farm I got that world right at my doorstep. 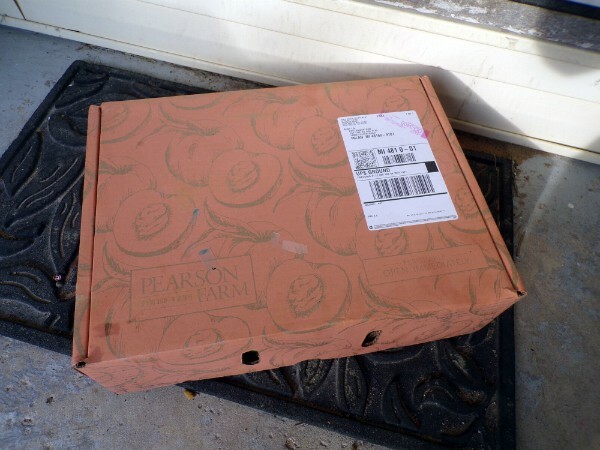 What a lovely box of peaches awaiting on my door step. I am seriously considering keeping these boxes around to put small or fragile items in for the next time I have to move. The proof of peach variety is when you go to the store one week, get amazing peaches, then go back to the same store, buy a ton the next week, and hate them. They were probably different varieties. A trip to the farmer’s market and you can find vendors selling peaches with different names – because peaches have different names, just like apples. In my quest to educate people on peaches, I discovered an amazing program that Pearson Farm started up this year. It’s called their Prince Peach Subscription. 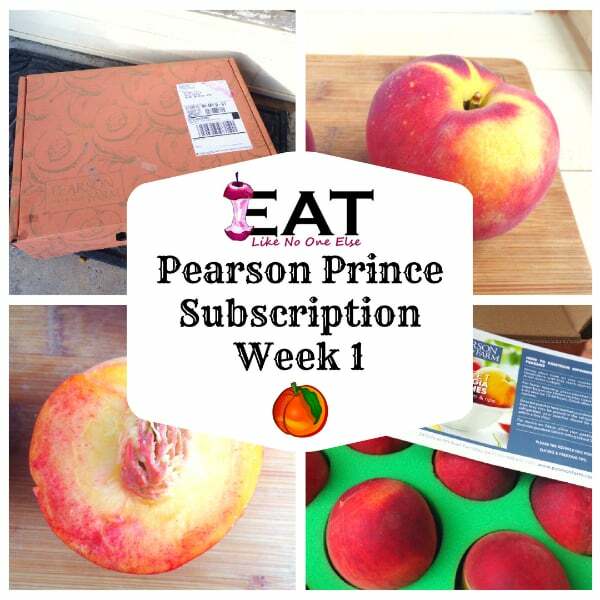 Every week for 6 weeks (minus the week of 4th of July), you can have a different variety of peach shipped to your home. They have the name Prince in them. Each box contains 13 pretty peaches, packed snugly so they don’t get bruised during their trip from Georgia. So this is how it’s going to work on the blog. For each box of peaches I am send I will be filling you in on my thoughts and feelings on them. I also be sharing about a topic on peaches – this week it’s What are Semi-Cling Stone Peaches? Each post will contain a recipe. 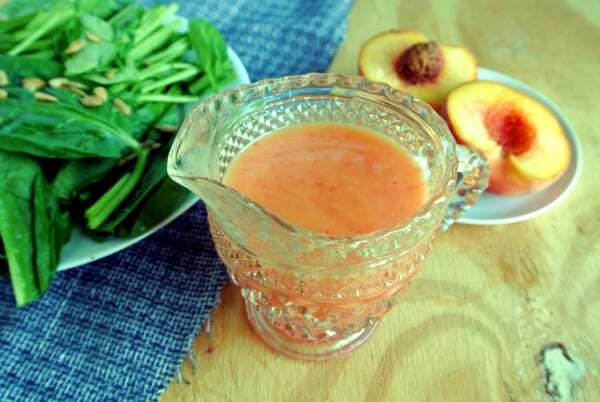 The recipes will be small batches recipes, where you will only need 1-3 peaches to make. Also sprinkled in will be a fact for you about Pearson Farm. She is pretty, isn’t she? Pearson Farm is located in Central Georgia near Fort Valley. They are about 1 hour and 45 mins from Atlanta – depending on traffic 🙂 They are a great place to take a detour to on if you heading down I-75 to go to or from Disney World. The sweetest detour you will ever take. These are Blaze Prince Peaches. So let me introduce to the first peach that I received in this series – the Blaze Prince peach. The skin is obviously influenced the name of this peach as it is set ablaze with red blush and bright orange in the background. What you find really fun about this peach as you bite into you will see even the red color skin has bled through to the flesh inside – making it a beautiful peach both inside and out. As for taste. These were pretty good. I did feel they were a bit more tart than sweet, which I was surprised by as I everything I read about this variety seem to indicate it was a low acid peach. No disappointment in the least bit here. A great choice to start the series. I was lucky to have one that was ripe enough to try the day after I got my shipment. I let some sit out for a few more days. The peaches held up really well. They didn’t just become mush. I believe the flavor improved. Once I got them to their peak, I put them in the fridge which buys me a few more days. If you do that make sure to bring them back to room temp for optimal flavor. Blaze Prince have what they call in the peach biz, a melting texture. Which means a smooth, buttery texture. Not fibrous at all like when you get a really stringy mango. When it comes to juiciness, watch out, you and the people around you might need poncho. I literally sprayed juice a couple feet away from me onto the living room floor. Peaches don’t get any juicer than this. I learned my lesson after the first one and ate the next one over a bowl – in which I drank the juice from afterwards. Pretty on the inside as well. I was able to get half of the peach away from the pit but still come flesh is clinging to it. 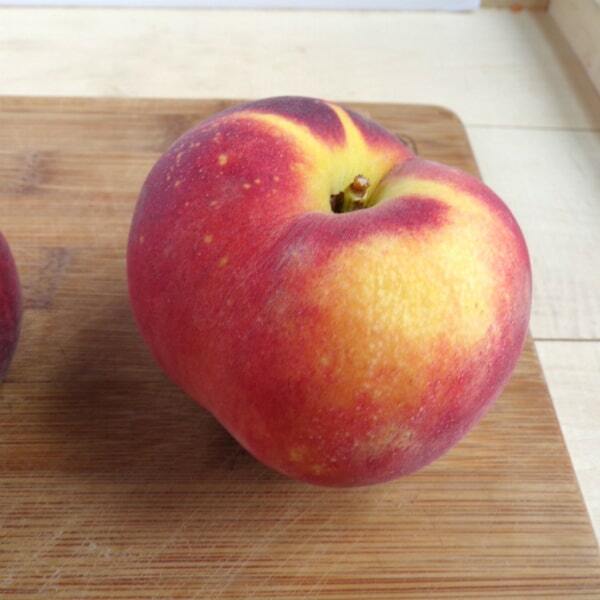 Blaze Prince may be described as a semi-cling stone peach. Peaches generally either are a cling stone which means the fruit sticks to the pit or a freestone, where the pit is easily popped out. A semi-cling stone peach, could be considered a freestone peach, however the pit doesn’t tend to come out that easily. I sliced the peach in half and gave it a gentle twist to make two halves. Cling stone peaches this doesn’t work at all. But with this semi-cling stone I was able to pull of the trick. However one half of the pit that pit was still stuck in. 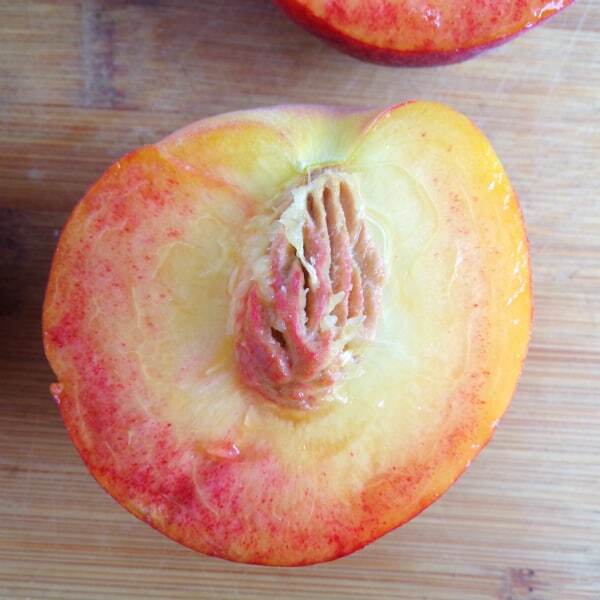 People tend to like freestone peaches better, since those pits are easier to remove. 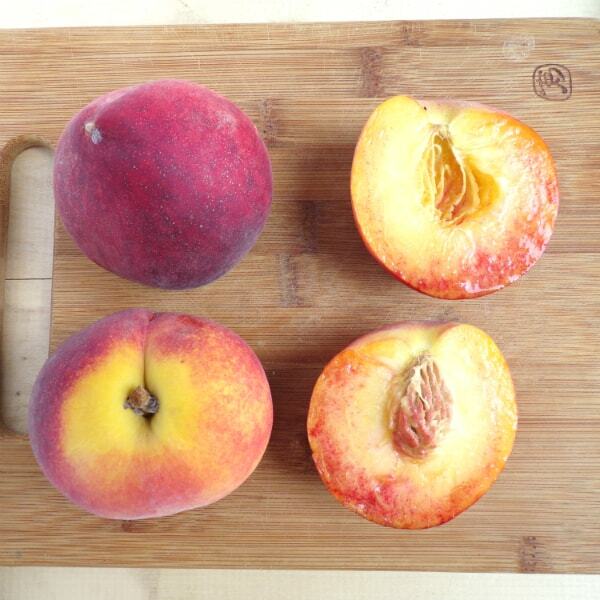 In most cases, the clingstone peaches are the earlier season peaches and the later varieties are the freestone. A simple to make vinaigrette that only has a few ingredients. The peach is the start of this show. 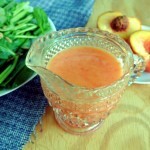 Each week I am going to include a recipe that you can make with only a couple peaches. Or in this week’s case – one large peach. The recipe below is for a simple vinaigrette that you only need 3 ingredients + salt for. The key thing is to pick white balsamic vinegar over traditional. The reason being the white doesn’t overpower the flavor of the peach. Also it produces a prettier colored dressing. 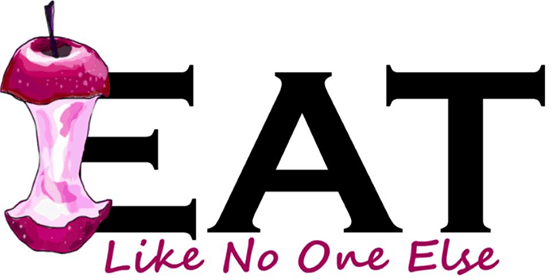 We do eat with your eyes! 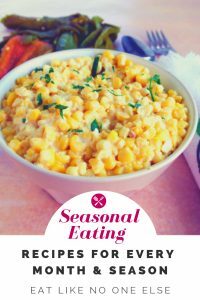 It makes enough for 3-4 salads depending on much dressing you like on your salad and/or how large your salad is.If you want the full rundown about of the recipe, check out this previous post. Previous Post: « What is a Good Price for Flat Iron Steak? THANK YOU for this tutorial on peaches! I’m from Texas, now in Maine, love to make peach cobbler, peach upside-down cake, peach butter….always looking, longing, for the incredibly sweet, juicy, flavorful peaches like the “Elberta” freestones my mother swore by. The kind of peach that you can smell the minute you walked in a store that had just gotten a shipment! 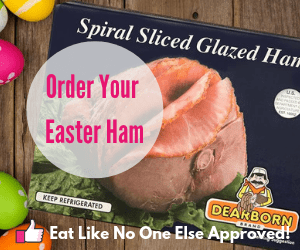 Do you know if Pearson ships to Maine IGA stores? When the really really REALLY great freestones might be in the stores? I don’t know I have any specific info on what stores get their peaches. I have seen them in a few stores myself, but not on a regular basis. What I would do is look for any peaches that are labeled Southern Peaches and check the PLU stickers on them to see if they are from Pearson. 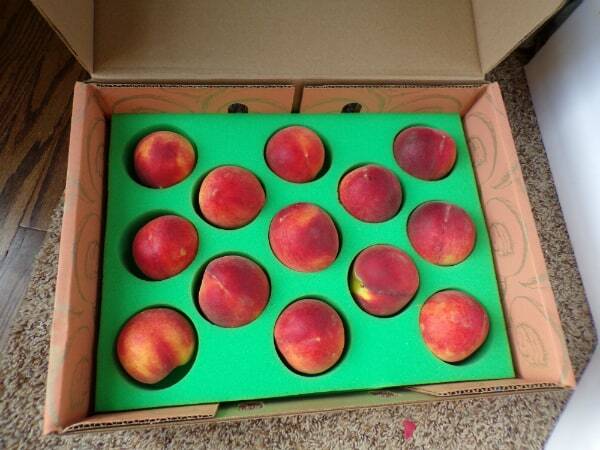 You can order their peaches to be shipped to your doorstep.